$2,999 Seen a lower price? The 2018 Gibson ES-335 Figured is more than top-of-the-line appointments and enhancements, it's a statement. AAA figured maple veneer and an Aquamarine finish create an impressive visual individuality. High-end appointments like the hand-wired MTC Premiere control assembly with Orange Drop capacitors and 550K matched pots, ABR-1 bridge with titanium saddles, and MHS humbucking pickups ensure that you sound as good as you look. 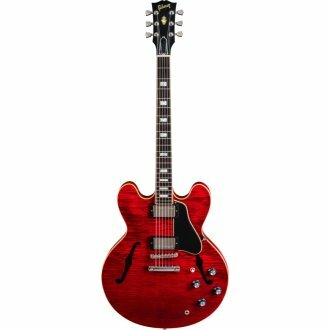 Same Day Music is an authorized dealer of Gibson products. Available until 11 PM (EST) today. Mention special code 201-X04G when you call.